I have been absent for a few weeks. I think about blogging every day, but never get to it. Where have I been? I haven’t been depressed or sick or even anti-social. It has been all about allergies at my house lately. First the dogs, one and then the other, and now I am suffering too. They toss and turn and so do I, itchy and uncomfortable. We are tired of having one foot in the world of the living. Last week I took both of my guys to the vet. They were so itchy that their scratching had opened up the skin and infected it. Barkley was the first on antibiotics. Two days later I was back at the vet with Shiloh. His situation was more dramatic, with blood all over his bed and mine. They are restless and get up in the middle of the night. I wash their bed covers and mine and try to keep them happy and distracted. The evil cone has come back out from retirement. I take the cone off for brief periods of time, during mealtime and potty time, but then the scratching and licking and biting begins all over again, and the cone goes back. Shiloh takes it all with equanimity. He is used to living inside the cone. Three weeks ago I started feeling itchy. My first thought was some tiny crawling creature that might have wandered in with the dogs. I googled fleas and ticks to see what they would look like. I checked the dogs. They looked clean of bugs. The itching raised hives and red rashes. 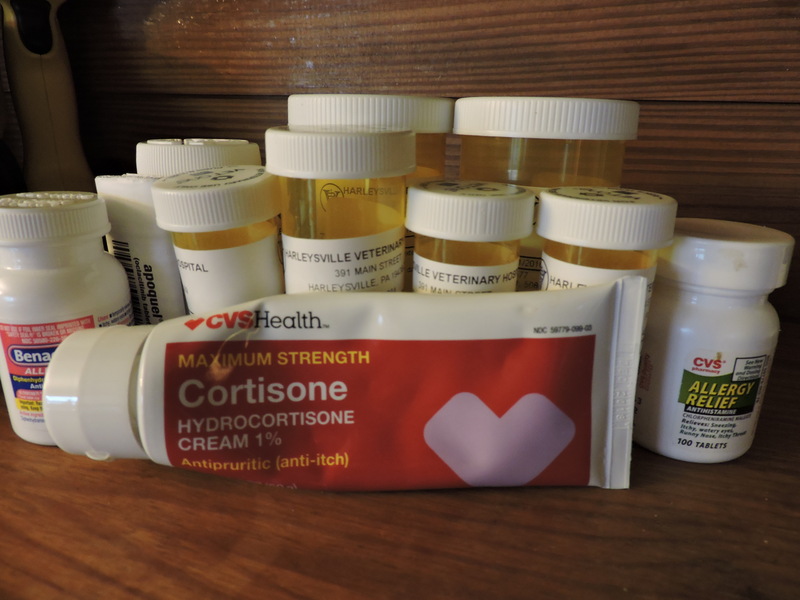 I stocked up on hydrocortisone cream and carried it everywhere with me. Nights are the worst. For some reason the itching steps up a notch at night. We are all exhausted. On top of everything Shiloh has dry skin and this bothers him. He is losing some of his hair. I sweep constantly to keep it under control. We all take Benadryl, and I have pouches of pill pockets on hand to dole out their meds. Shiloh is on so many meds it’s starting to get to him. He is lethargic and not his usual peppy self. We added a new med for his arthritis, and are taking him off of another for his allergies. One of his meds was making his sick and he would wake me up multiple times during the night to throw up. I don’t know when this will end. It’s taking a toll on us all. On Friday I learned that my vet had completely misdiagnosed my guys’ medical issues. They had doggie scabies, otherwise known as mites. Despite multiple visits over a month he missed all the symptoms. He assumed that scratching meant allergies. He didn’t bother to look more than skin deep — no pun intended — for the real issue, content to treat what he saw on the surface. For weeks Shiloh suffered unnecessarily, and I’m angry about it. The only good news is that doggie mites cannot live on humans, but they do cause itching. I don’t have allergies. I spent the past four days cleaning and doing laundry and vacuuming and then starting all over again. I closed off part of the house, rolled up carpets, covered furniture, and scrubbed floors. I’m still not sleeping, but my guys are finally resting now that they are being treated for the correct malady. It will take weeks for Shiloh to get back to normal. He’s probably had this for well over a month, maybe longer. I have to call my doctor to see what I can do for my itching. One day this nightmare will be over. I won’t go back to my old vet. I am so thankful that the wonderful woman who does acupuncture for Shiloh is also a wonderful vet who cared enough about my pet and what was ailing him to come up with the answer. In our daily lives we have relationships with many people. This include doctors, lawyers, bankers, the people who repair our cars and cut our grass and teach our children. Some are content to do the minimum; others are proud to do their best. I know that I have to work harder now to tell the difference. I trusted someone because they had a credential and experience. That doesn’t necessarily equal excellence. Shiloh is sleeping through the night now. Maybe one day I will too. Oh you poor dears. It sounds perfectly miserable and I hope it clears up fully and quickly. Sending waves of good thoughts and hugs. Thanks BJ. He is getting better, but it will take a while. On top of his rehab for surgery a few months ago, he has had a rough year so far. We hope that once he finally gets over this we can get back to a more normal life for him.